Nutmeg is a Sea Otter 18 canoe yawl, built in 1996 by David Moss Boat Builders. 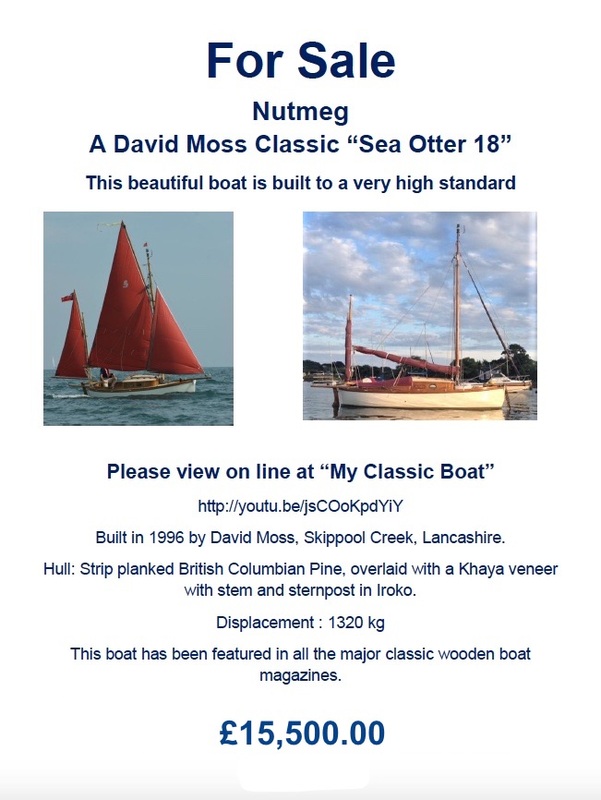 Nutmeg (previously named Rebecca) has been featured in Classic Boat Magazine, Water Craft Magazine, and The Boatman Magazine. Radio Cobra MR F55EU DSC VHF with masthead ariel. Compass Silva 70 with a deck fitting and storage fitting. Tohatsu 4 stroke MFS 4B outboard with both top tank and an external tank located in port side locker. This engine is serviced each season, cleaned and dry stored. Service includes engine oil and gear oil change, fuel filter replacement, impeller change. New s/s cotter fitted to prop. This engine has a charging facility. Engine mount, purpose built stainless steel removable bracket. Gunter Mizzen Tan 34 Sq ft. with cover.